The TAP PM Sports Memory Mate Series is a traditional style memory mate. These memory mates are designed to hold an individual portrait and a team picture. 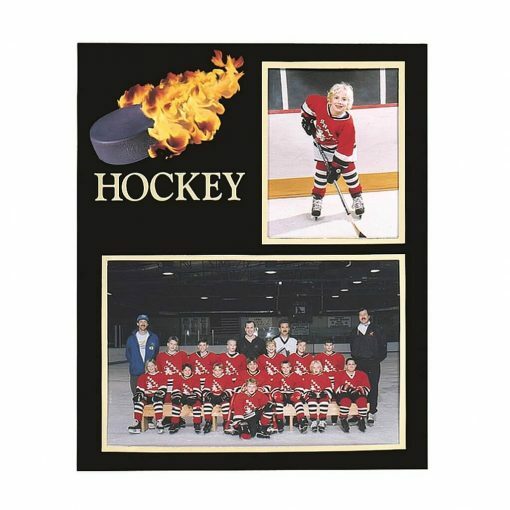 This memory mate series is known for the ‘Flaming Ball.’ The TAP PM Sports Memory Mate Series is available in ten options: All Sports, Plain, Soccer, Hockey, Football, Baseball, Basketball, Softball, Volleyball, and Lacrosse. Don’t forget to add foil imprinting with your studio die and the name and date of the sports team. Pull out stand on the back of the mount. An autograph section on the back. Matte black, with gold foil border and accents and full-color sports motif.